The use of dressings around an intact stoma site is unnecessary (with the exception of silver tubes, or following surgery to the area or where the tracheostomy is within a radiation field). Tracheostomy tubes have soft flanges (except silver tubes) that do not require a dressing between the tube and the skin. Dressings provide an ideal environment for bacterial colonisation. In patients who have a surgical or percutaneous tracheostomy created, sutures may be used to secure the flange of the tracheostomy tube to the skin. These sutures should be removed 5-10 days post insertion depending on local policy. In addition, surgical tracheostomies may have a Bjork flap formed to open the trachea to allow the tracheostomy tube to be inserted, this may be sutured. This suture should be removed 24-48 hours post removal of tracheostomy tube depending on local protocols. Secretions collected above the tracheostomy tube/cuff may leak out of the surgical incision and stoma site. The resultant moisture can promote irritation of the skin and lead to skin maceration and excoriation. This increased moisture may act as a medium for bacterial growth or prevent the stoma site from healing. If a dressing is clinically inicated, gauze swabs should not be used. A polyurethane type dressing is recommended as bulky dressings raise the tracheostomy tube and may cause discomfort to the patient or result in tube dislodgement. 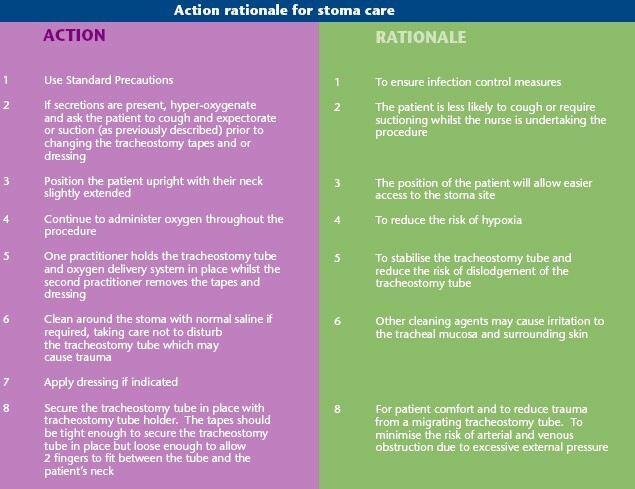 All patients with a tracheal stoma/tracheostomy should have frequency of stoma care individually assessed with care undertaken at least twice daily or more frequently if required using clean technique. CHANGING A TRACHEOSTOMY DRESSING IS A 2 PERSON TECHNIQUE, ONE OF WHOM SHOULD BE A COMPETENT HEALTHCARE PRACTITIONER.